The mission of the McGill School of Continuing Studies is to anticipate and respond to the educational needs of our learners and partners, both domestic and international. Promoting transformative learning through innovative programming, cross-disciplinary curricula, and specialized resources, we help our students to realize their personal and professional goals and thrive in a rapidly changing world. 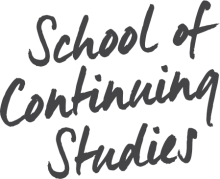 Through its commitment to providing wide access and uncompromising quality, the McGill School of Continuing Studies impacts diverse communities as a dynamic force for positive change, and contributes to individual, organizational, and societal advancement. We are learner- and client-centered, and responsive to their evolving needs. We actively collaborate with our colleagues and partners at McGill and within multiple communities. We strive to achieve the highest quality and excellence in everything we do. We champion innovation, entrepreneurial approaches, learning from experience, and anticipating future opportunities. We are accountable to ourselves, to each other, to the University and to our multiple stakeholders for advancing the mission of SCS. In 1899, McGill first introduced summer school for regular McGill daytime students, providing off-session regular program classes administered by the University’s Extension program. As the demand for continuing education grew, extension, extra-mural, and adult education courses became more readily available. Today SCS has over 15,000 students pursuing language classes, professional development courses, community engagement, and more.